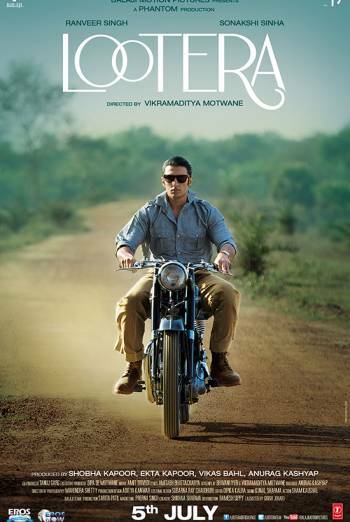 LOOTERA is a Hindi language romantic period drama in which a man falls in love with a landowner's daughter and then betrays both her and her father when he steals from them and goes on the run. There are some scenes of moderate violence, such as when the protagonist is involved in a shoot-out with police and accidentally shoots an ally in the chest. Although detail of the impact is limited, there is some sight of the bloody gunshot injury to the man's chest as he lies dying on the ground. Towards the climax of the film, the protagonist himself is hit by a long-range gunshot. There is brief detail of a blood spurt as the man slumps to his knees before he dies. There is a gory image when a man has to take a bullet out of his own wound. A close up shot shows the bullet in the wound as the man prepares to pull it out with some scissors. Aside from the shot of the flesh wound and bullet, there is no detail of the actual act of removing the bullet. There is also some mild bad language in Hindi (eg 'saala').